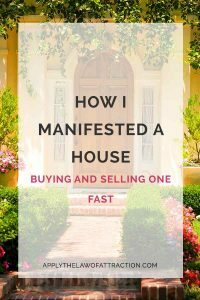 Home » How to Manifest » How I Manifested a House – Selling and Buying a New One Fast! Buying and selling houses with the Law of Attraction is something I have been successfully manifesting for over 15 years. Each time I decide to move, I manifest a better house than the last. The first time I used the Law of Attraction to move, I was living in a rundown mobile home in an equally rundown area. There was no air conditioning, and in the summer it would get hot enough to cook an egg on the sidewalk. Every holiday, police cars would drive around the neighborhood blaring a recording stating that it wasn’t safe to fire guns in the air. It wasn’t the best area, but it’s where I grew up. To me, it was home…until I decided it was time for my mother and I to move somewhere nicer, somewhere safer. Two months later we moved into a new home. It was my first time living in an actual house. It was safe, spacious, and, best of all, it didn’t have any holes in the floor! While that home would be unimpressive to most people, it was a vast improvement from where I was living just a few months earlier. I lived there until I finished my studies. About a month before I graduated (I graduated in December of that year), I learned I had to move for work. Between final exams and my start date, I had a very narrow window for everything to work out right. I had to sell my house and buy another by December 21. I decided I would move by December 19. I had an unwavering belief that everything would work out, despite everyone telling me all the obstacles. I never prepared a backup plan because I never believed I needed one. I knew I would move by December 19. And I did! On December 19, the moving van drove off with all of my household items, and I drove off in my car with my cat. Both houses closed on the 20th. The driver for the moving van lived in the same area I was moving to and was on his way home for the holidays, eliminating any delays. He delivered everything as soon as he arrived on the 21st. I still had never heard of the Law of Attraction. I simply used the techniques I had used all my life to create what I wanted. It’s the basis for everything I write about here and in my books. I know it works because it’s what has always worked for me. I’ve been manifesting and teaching friends and family the art of creation since long before Rhonda Byrnes created “The Secret”. I’ve learned that the more you use heart energy and the Law of Attraction together, the more powerful your results become with the Law of Attraction. Manifesting really becomes effortless. Also, the longer you do the various techniques I teach on this site, the more you’re able to surrender and trust that everything is working out for the best, what you want is coming to you, and only good things are drawn to you. This adds a power to your life where you shift from playing small to going big in your manifesting. You’re truly able to receive much greater abundance, joy and fulfillment in your life. My family and I were no longer happy with the area we were living in. Personally, I wanted change. I was tired of playing it safe and staying in a familiar area simply because it was comfortable. I chose to jump past my fears and put my full faith in the Universe to guide me to a new area that was more aligned with who I am. My family and I are happy living there. It is a healthy and safe area. Our house sells with more than enough money to pay off the mortgage, realtor fees, and closing costs, with money to spare. We find a new house that makes us happy, and is healthy and safe, in the perfect timing. It is for terms that we love. There was more, but as you can see, I kept the list general. I focused on things that were important, and how I wanted us to feel. I trusted that the Universe has our best intentions in mind. I knew that if it found us a house and a new location that made us happy, it would have to be a great place that had everything we wanted. When I created my list, I forgot about some key things around the sale of our old house. You see, we got a fantastic full-cash offer on our house the second day it was on the market. The only catch was that it was contingent on the sale of the buyer’s house which hadn’t even been listed yet! That was a big no go for us. It was also a lot faster than we expected things to happen. With the housing market, we thought we could take our time. We hadn’t even started looking at new houses yet. OOPS! When you're aligned and don't have resistance, the Law of Attraction really can move mountains! I didn’t bother going back and changing my list because I knew the Universe is always listening. I simply told it out loud to slow down and to give us an offer that wasn’t contingent on the sale of another house. For the next four weeks, we could have received another 8 offers if we had been willing to take the contingency. Since we weren’t, the various buyers decided to wait until we changed our minds. However, by the end of these four weeks, it was getting a little tedious. I’m not the most patient person and I was ready for things to be over with, so I asked for things to speed up again. That weekend, we found a house we loved. Everything about it matched the list. That same day, we received a fantastic offer on our old house. Perfect timing! Thirty days later, both houses closed escrow and we were moved. From start to finish, everything took less than three months. There’s really no difference between manifesting buying a house or manifesting selling a house. The same techniques are used for both. It’s about getting clear on what you want, asking for it and allowing it to happen. As you can see from my story, you can even use the Law of Attraction to manifest the sale of an old house to coincide with the purchase of a new house. Thanks so much for sharing this story, great and inspiring as usual! I’m glad you enjoyed it, Nina! I know how it feels! Awesome! If we are manifesting love, is there a way to ask the Universe to speed up the process like you asked it to speed up the selling/moving process of the house? You have to do it from a place of no resistance – no neediness, no loneliness, no fear, etc. If you notice, I had no resistance to moving or selling my house; otherwise I wouldn’t have received an offer on the house so fast. Slowing things down was me putting up a block that said I wasn’t ready. I needed more time. Resistance is a block; my not being ready was a form of resistance. I suddenly resisted moving until I was ready. When I was ready again, I stopped resisting moving and I suddenly received the offer I wanted. So, yes, you can ask for things to be sped up, but you have to be doing it from a place of no resistance. If you need things to be sped up, it’s likely a sign that you do have resistance. If you didn’t have resistance, you’d already have the results you wanted in your love life. Ahh I think I see, thank you! That’s is such a great way to explain resistance. Congratulations on your new home, and Welcome Back! Thanks Claudia! I’m glad you like the explanation! Another great LOA story. Thank you for sharing Elizabeth. I enjoyed reading it. It’s time now to change my living situation in a similar fashion. Thanks! I hope you have a lot of happiness in your new living situation!